The National Chairman of the All Progressives Congress (APC), Chief John Odigie-Oyegun says despite the challenges experienced by President Muhammadu Buhari’s administration it has still been able to deliver on its election promises. He said one of the major promises of the APC – the fight against corruption; is being won to the extent that it can no longer be a threat to the national economy, where it becomes an acceptable way of life, of doing business. According to a statement signed by the APC’s Assistant Director of Publicity, Edegbe Odemwingie, Oyegun made this known on Tuesday when he received the Rector of the Federal Polytechnic, Bida, Niger, Dr. Abubakar Dzukogi and the management team of the polytechnic at the Party’s secretariat. “I am particularly pleased by your recognition that in spite of difficulties, challenges the government of the APC is delivering on its promises to the Nigerian people. That is important for me and I really see this award as coming to me on behalf of the government and party. It is the passionate leadership of President Muhammadu Buhari that has made it impossible for opponents to distract and derail the administration. “Yes, there are still challenges in the land, there is no question about it and as you rightly said, we took over in very difficult circumstances including a fundamental problem of the collapse of the price of crude oil. “Conditions were such that we needed an extraordinary man of courage to be able to lead the country out of the crisis that we inherited to the increasing economic stability and progress which this nation clearly is beginning to attain,” he said. In the area of security, the APC National hairman noted that the administration has recorded successes particularly in the fight against Boko Haram terrorists which have been limited to attacks on soft targets. He also highlighted successes the administration has recorded in the area of infrastructure and the fight against corruption. “On infrastructure, a lot of beautiful work is going on, particularly on the railway system. You cannot carry meaningful development on trucks on the highways. Development has to be carried on the back of a modern railway system and the president has made that a top priority and today we can say on the implementation platform is 5000 km of modern standard gauge railway that will cut across the length and breadth of this country. “On corruption, we all know that corruption is fighting back. But it is not a problem you fight with a flick of a switch, because corruption is very rich, corruption is very wealthy, corruption is very elitist, they are bound to fight back and they are fighting back. But thank God we have a president who is single-minded about taming that scourge and tame it we will. We know now that corruption is not as brazen as it was,” he stated. Also during the visit, Oyegun was informed of his nomination for a fellowship award and invitation to the 15th combined convocation ceremony of the Federal Polytechnic, Bida, Niger, scheduled for March 28, 2018. The Rector of the Polytechnic, Dr. Abubakar Dzukogi said the nomination was informed by many successes recorded by the APC-led administration. 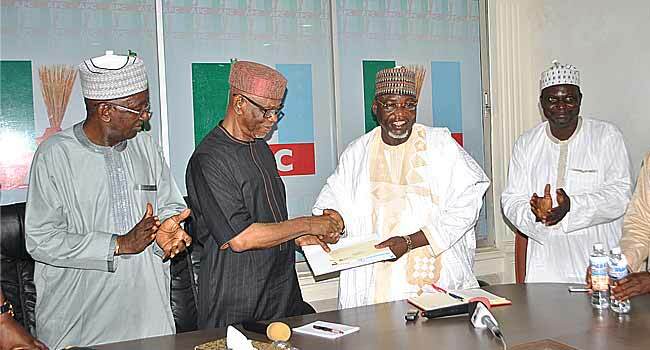 While hailing the APC National Chairman for leading the Party to the 2105 presidential election victory and successive electoral successes, the Rector described Oyegun as a “master strategist”. “We have taken into consideration, your contribution to education generally, both in and outside government. But more significantly, being a national chairman of a party that brought in this government, it wasn’t an easy task but you succeeded because you are a master strategist. Having put in place this government, the government has been doing wonderfully well to the acceptance and admiration of Nigerians,” he stated.